Whether you buy crochet sun hats for baby or make one yourself, the result will be adorable. A crochet hat made of organic fiber is soft, comfortable. 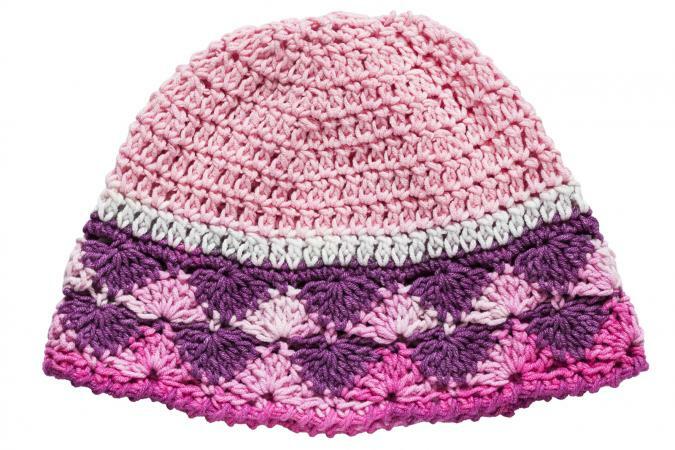 These hats allow the baby's delicate skin to breathe, while protecting that lovely skin from the harsh elements. The best clothing for babies is always going to be the simplest items made from the highest quality materials. At Etsy, the site for individual designers, you can find many options for crocheted baby hats. Some have ribbon bands, others have flowers or other embellishments. You'll find hats with brims as well as some beanie styles, and there are colors to match nearly all of your baby's outfits. By far the most popular way to obtain a crocheted sun hat for a baby is to make one. Both knitting and crochet have regained popularity in recent years. They are fun ways to create unique clothes and can be more economical as well. For those who are not very experienced with knitting and crochet, baby clothes are ideal first projects because they are so small. You can finish something in a comparatively short amount of time and enjoy the pleasure of accomplishment, then start to become more ambitious. One excellent source of free online patterns for crochet sun hats is Crochet Pattern Central. The patterns are posted by individual users and so some may be easier to follow than others. The Lil' Sunhat, featuring a ruffled brim with optional trim, is for those on an intermediate level. You can also try the Baby Sun Toboggan, which the designer describes as "easy/medium." Another fine source of free patterns is All Crafts. Many of the patterns listed link to other sites from which you can download the pattern. They also have vintage patterns, which can be very charming for baby clothes and hats. Whether you crochet your own sun hat or buy one, there's no doubt that this is one garment every baby should have. Protecting your child's head from sun exposure now can help prevent skin cancer later on in life, so make sure you have a least one sun hat in your child's wardrobe.